Properties in Ariege average 4.6 out of 5 stars. Property 2: Romantic 17th century village house with private spa, bakery and butcher within walking distance. Family friendly, outdoor fun in a beautiful part of the world. Property 34: Family friendly, outdoor fun in a beautiful part of the world. Charming cottage in Ariège Cathar Country 8 km from Mirepoix Medieval city. Property 35: Charming cottage in Ariège Cathar Country 8 km from Mirepoix Medieval city. Beautiful setting! Really interesting and unique metal work and design. No IKEA crap. 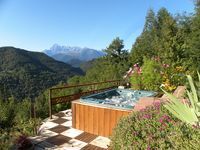 Hot tub with amazing Mountain View&rsquo;s. Well equipped kitchen. Clean and quiet. Great for VTT and hiking from front door. nice apartment near a small river in a rural mountain region. Good support from the Mike who was renting the place. Lots of information on what to do in the region present. We liked the hiking in the surrounding.